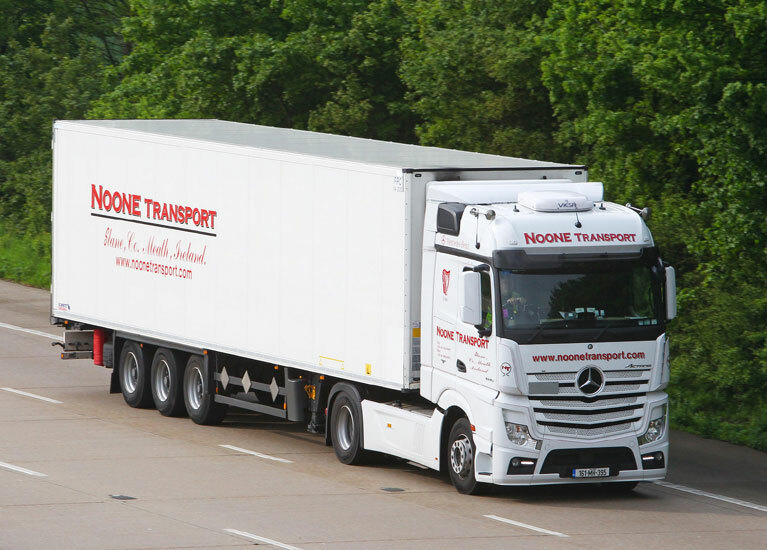 Noone Transport Ltd is a family run business which caters for both national and international transport. 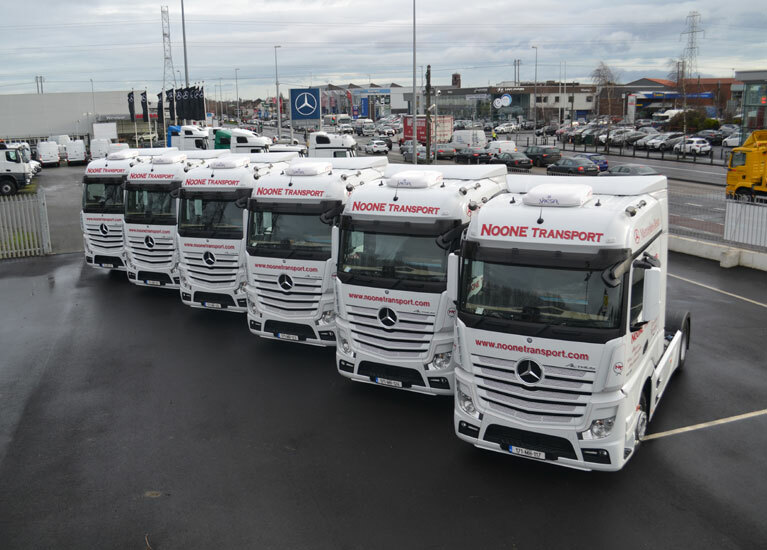 We cater to clients across Ireland and Europe – whether it be full or part loads, temperature controlled or ambient loads we can meet your every need providing quality transport solutions both nationally and internationally. We have been in operation since 1986 and cover a wide range of sectors in the transport industry including food, retail and pharma. We can provide our customers with a wide range of transport solutions on our wide variety of equipment which includes secure box units, euroliners, curtainsiders and temperature-controlled fridge units. Along with a dedicated national transport service we provide a continental service covering most major Europe destinations including the UK, Belgium, Holland, France, Spain and Germany. Other destinations can be served depending on the transport specifics – please contact us with your requirements. 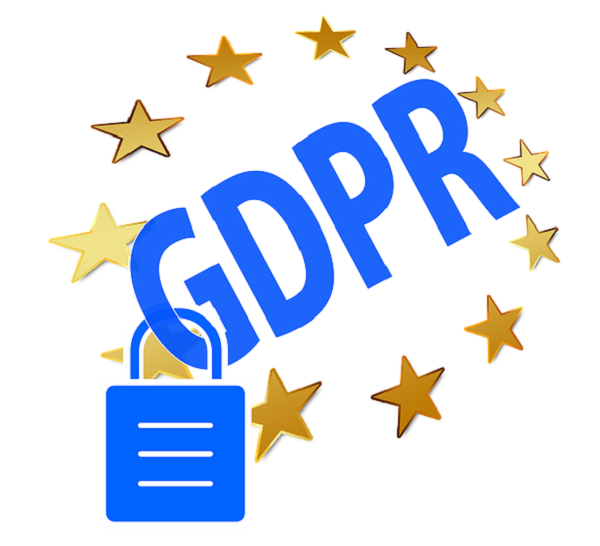 We at Noone Transport Ltd. respect your right to privacy and comply with our obligations under the General Data Protection Regulation (GDPR). The purpose of this Privacy Statement is to outline how we deal with personal data provided to Noone Transport Ltd.
Any links to other external websites are clearly identifiable as such, and Noone Transport Ltd. is not responsible for the content or the privacy policies of these other websites. 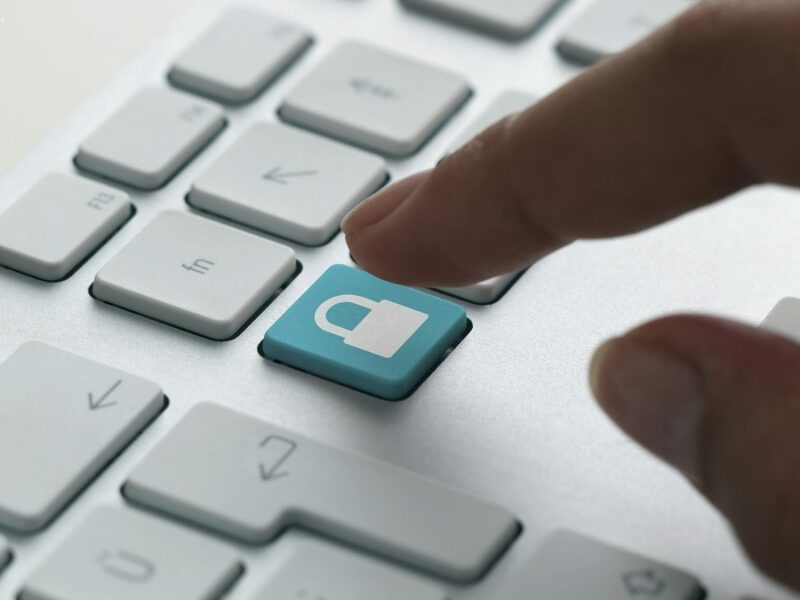 Protecting your privacy as a user of our website is important to us and we strive to keep all information relating to you confidential in accordance with this statement. The purpose of this Privacy Statement is to explain what Personal Data we collect about you, how that Personal Data might be used and how we protect your Personal Data and privacy. If you are merely visiting the public areas of our website, we do not collect any Personal Data about you. We reserve the right to access and disclose Personal Data to comply with applicable laws and lawful government requests or requests by the police investigating suspected illegal activities, to operate our systems properly or to protect ourselves. By using the services on our website, you consent to the collection and use of your Personal Data by us for the purposes outlined above and for any other purpose which is reasonably necessary for the provision or proper administration of Noone Transport Ltd.
We will be happy to answer any enquiries from you. If you have any questions or comments please contact us at: info@noonetransport.com or us the Contact Form below. We’re trusted throughout Europe for our dedicated transport service. But for your added peace of mind, we’re also members of the Irish Exporters Association as well as being holders of ISO 9001 and 18000 certification. We are also currently undertaking the FORS accreditation process. Both our head office team and our drivers operate to the highest levels of professionalism and customer service as they carry out their individual roles. Our drivers are ADR and GDP-certified and so are licensed to carry hazardous goods. They are also aviation security trained enabling them to pick up and deliver from airports too. We are committed to ensuring our equipment matches the best on the road and we currently have a quality 43 truck fleet – the vast majority of which (38) operate to Euro VI standards with the remainder (5) operating to Euro V standards. Our fleet consists primarily of Mercedes tractor units including a recent delivery of 10 new 171 models. We utilise the best technology available including Fridge Tracking by ThermoKing, Truck Tracking by Transics, Transport Management System by Eureka while ProVision vehicle safety cameras have also been installed in all our vehicles to help manage our risks on the road. To ensure the secure delivery of all goods, all our trailers are fitted with heavy security container locks by Vadac. 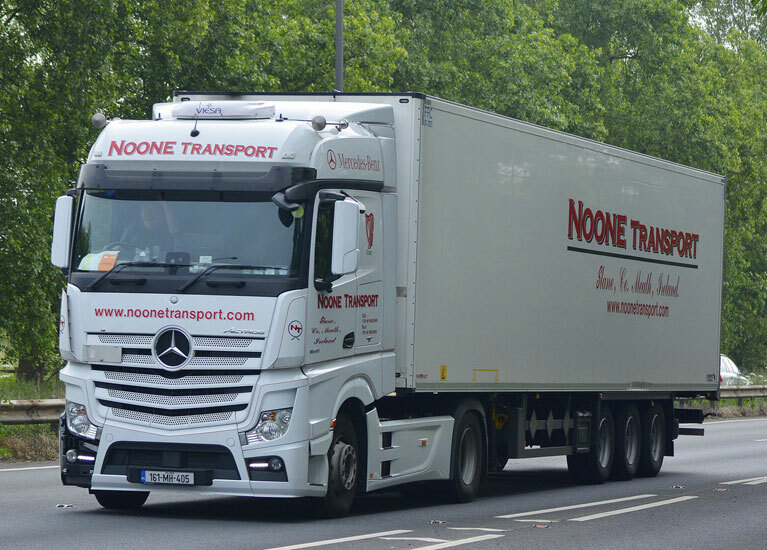 Here at Noone Transport, our family-run business has been trusted to deliver more since 1986. Contact our office which is located 30kms north of Dublin, 4 kms from the M1 and 2kms from the N2 leaving us conveniently located near the two major routes joining Southern and Northern Ireland. Here in Dawn Farms Distribution we like to build partnerships that last and use partners similar to us that put the customer at the heart of everything. Service to our customers is hugely important to us, and so when it comes to providing the final link in a quality driven supply chain we choose our partners wisely. Noone Transport is one such partner. For over ten years they have given us tremendous support and service when it comes to meeting the exacting needs of our many Irish Food Customers.